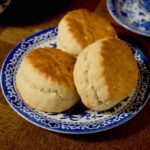 What is bò lúc lắc? Bò lúc lắc is a very popular dish of Vietnamese cuisine. 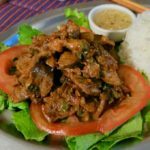 It consists of beef, usually sirloin or rump steak marinated in many flavors typical of the country’s gastronomy, that is then sautéed and accompanied with raw vegetables and white rice. 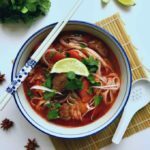 Bò lúc lắc is also popular in neighboring Cambodia where it is known as lok lak, and Cambodians often claim its paternity, although their version is accompanied by rice with lemon juice and tomato paste, which makes the rice very red. 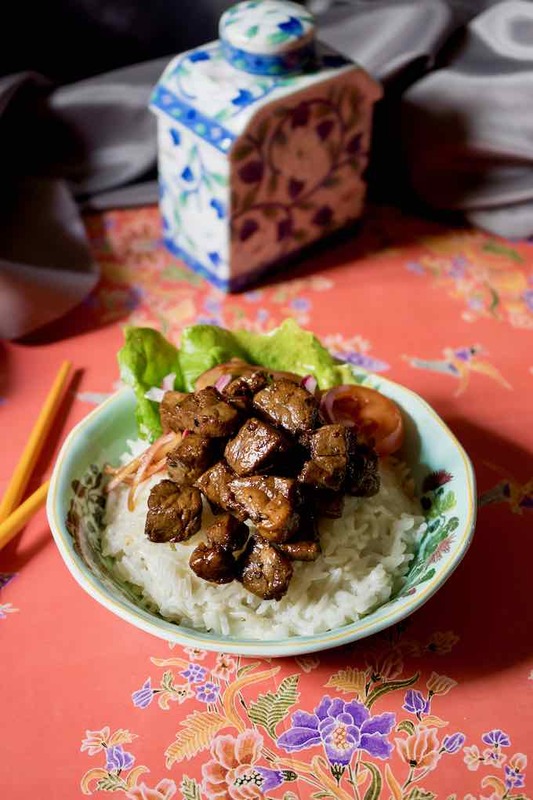 In Vietnamese, bò means beef, lúc lắc means stir and shake, illustrating the movement to stir the cubes of beef in the wok in which the dish is prepared. 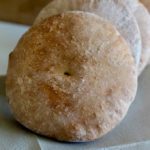 How to make bò lúc lắc? 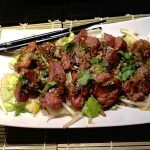 The sirloin or rump is cut into regular cubes and then marinated in a mixture of chopped garlic, sugar, black pepper, soy sauce and nuoc-mam (fish sauce). The red onion is marinated in the vinegar separately so that it remains crisp. The meat is sautéed on very high heat in a skillet or a wok with garlic infused oil. The marinade is added and left to cook, stirring constantly for a few minutes. The meat should be very tender and juicy. The cubes of beef are served on a bed of salad, lettuce or watercress. A few slices of raw tomatoes and marinated onion are added. The salad is served with a bowl of white rice on the side. What is the origin of bò lúc lắc? For the Vietnamese, bò lúc lắc testifies to the French influence on the country which was formerly named Indochina during the colonization which began in 1887 and extended until 1954, when Vietnam became independent. 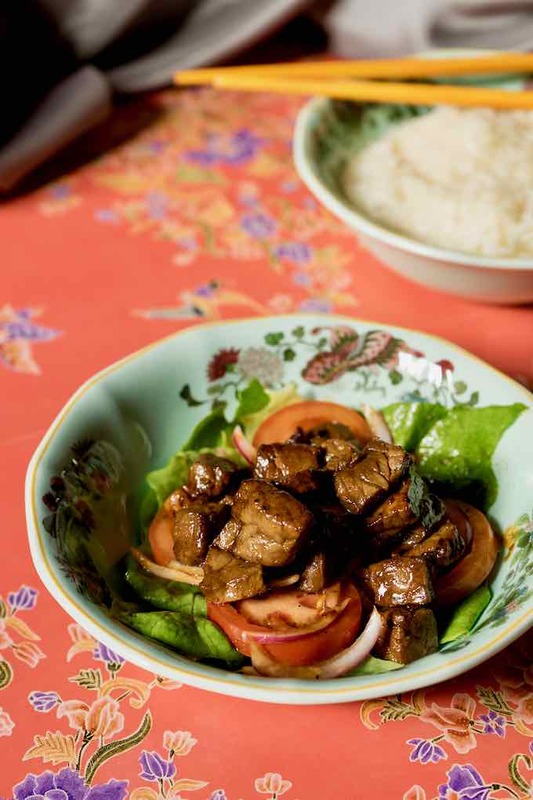 It was during this time that the consumption of beef increased among Vietnamese. 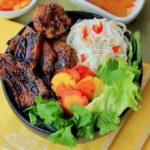 The salad is composed of tomato, onions and green salad as in French salads and does not include aromatic herbs as it is customary in the rest of Asia. 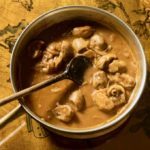 The use of soy sauce comes from Chinese cuisine, which dominated the region until the 10th century after a reign that began in 111 BC and ended in 938 AD. Nuoc-mam is regularly used in Vietnamese cuisine. These are small fish fermented in brine for over a year and whose jars or wooden barrels are arranged in the sun. Its taste is powerful and nuoc-mam usually replaces salt (just like soy sauce). 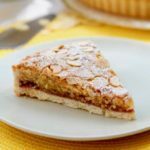 Its taste, similar to that of anchovies, is excellent with beef and it is not uncommon to associate the two as the French do in the gardiane de taureau prepared in the Camargue region. Nowadays, bò lúc lắc and its Cambodian version are dishes that have exported particularly well as they have become popular around the world. 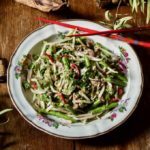 Most Vietnamese and Cambodian restaurants offer the salad in Europe or the United States. 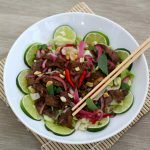 It is therefore a real journey that the story of this beef jumped between Chinese and French influences and its popularization throughout the world by Cambodians and Vietnamese. What are the other versions of bò lúc lắc? Bò lúc lắc can also be accompanied by French fries, another vestige of the French presence in the country. Other crudités can also accompany this dish, such as cucumber, seasonal beans or peppers. Tomatoes can also be replaced with cherry tomatoes. Cambodians use Kampot pepper for their lok lak version. A pepper that is found at the seaside and whose flavor is particularly refreshing. 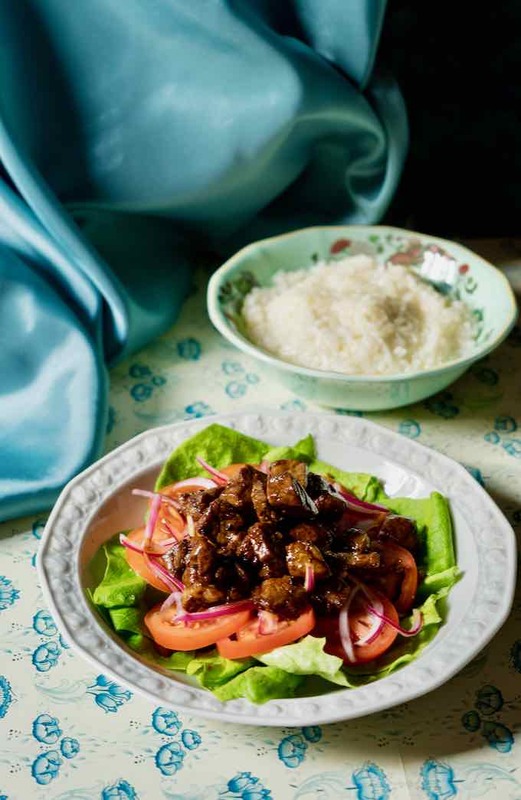 Bò lúc lắc is a popular Vietnamese dish prepared with marinated and sautéed beef, and served with a garnish of salad and rice. Cut the beef into ½ inch cubes. Finely chop 1 clove of garlic. Crush the other clove. 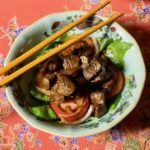 In a large bowl, add the beef, chopped garlic, sugar, pepper, soy sauce and nuoc mam. Combine all the ingredients and marinate for 1 hour in a cool place. The meat must be very cold when it starts to marinate. Separately, marinate the red onion in vinegar for 1 hour. Wash and drain the watercress (or lettuce). In a large soup bowl, place a bed of watercress. Arrange the tomato slices on the salad. Heat a frying pan over high heat. Add the oil. 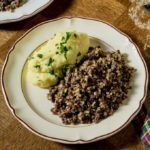 When the oil begins to lightly smoke, add the crushed garlic clove, fry it quickly for 20 seconds around the pan by stirring with a wooden spoon. Add the beef with the marinade while maintaining pan at high heat, and stir the beef constantly for 3 to 4 minutes with a wooden spoon. Place the meat in the middle of the salad and add the onion and marinade around the meat. 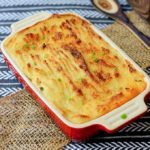 Serve immediately with a bowl of plain rice.